INTRODUCTION: Note – I’ve provided over 1000 infographic elements, icons and images! The winner of this contest gets the contest prize money and will also be given the first opportunity to complete Part 2 of the project which consists of finishing the design. 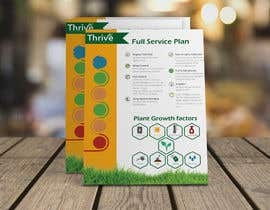 The goal of this contest is to design the layout for an 8.5” x 11” infographic flyer using the infographic elements I’ve provided (feel free to use/find your own elements and graphics…whichever makes for a better design). Please Note: This is the first of 8 direct mail designs we will need over the next two months. We have two different brands and will need 4 designs for each. If we find someone who's a good fit, we'd be happy to use that person for our other design projects moving forward. In addition to graphic design, we are also looking for help with projects requiring the following skills: Database design (MySQL), Python/Web Scraping, PHP, Web Forms, Surveys, Website Design, Zapier and Web API's. STEP 1: DESIGN THE LAYOUT --- [Step 1 = This Contest. This design shouldn't take you more than 2 hours of work.] We have a list of content/infographic sections that we'd like to be included in the design. We know where we want the different sections to be (front or back) but the rest is up to you. You're the designer, so we're leaving it up to you to create the design. 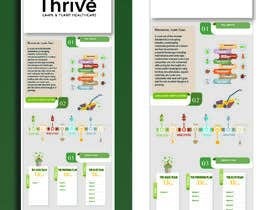 Use the infographic elements we've provided (.pdf, .ai, .eps, .jpg, .png files) or find/design your own. We have 2.5 GB of infographics so there are plenty to choose from. However, please don't force a concept/content into an infographic element if it doesn't make sense. More details for Step 1 will be provided after the description of Step 2 as well as in the project files. STEP 2: FINISH THE DESIGN. [STEP 2 IS NOT PART OF THIS CONTEST…IT’S THE NEXT STEP AFTER A WINNER IS CHOSEN] Step 1 is simply creating the general layout and look of the flyer and establishing where all of the elements and sections will be placed. Step 2 involves adding all of the final details, text/content and enhancing the initial design from Step 1. I won't go into any more details for Step 2 since this contest only involves Step 1. 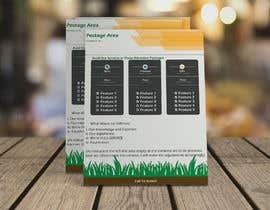 However, the reason why we're dividing the design into two steps is because we want our mail pieces to look extremely professional and to be very high quality and we've found that dividing the design process into these two steps results in a higher quality design. 1. I am going to start this contest and will be available for questions shortly after the contest starts. 2. I will let everyone design for a few hours and then I'll give our first round of feedback. 3. After feedback is given, you can revise your designs. 4. Then we will choose a winner and the payment will be released. 5. Once a winner is chosen, he or she will be offered the project to complete Step 2 for an amount we'll agree upon before the project starts. The project files contain all of the information, assets and elements you'll need. > Refer to the Read [login to view URL] file first. This file contains the specific instructions for the design. > We will need the completed PDF file as well as the original psd, ai, indd, etc files. > We would like to pick a winner in 2 days. I go into work in three hours. We will be choosing a winner shortly after I get there. My boss asked me to not give too much feedback because he wanted to see what designs you guys would come up with on your own. And it looks like it worked out. I'll be back on here when I get into work. Sounds great. I'm just finishing up on my 2nd page design so that you can review both sides before making your decision. Hi there, Please check #11 , I've improve my first entry, I'm sure you'll really like it. Will upload design soon. Thank you. 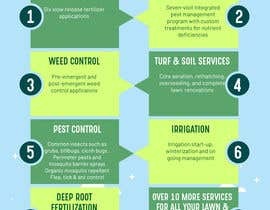 Here are some infographic designs I really, really like. I would recommend using them for inspiration. Entry's 2, 3, 6 and 7 all are pretty good designs...but they're also very close in terms of quality and aesthetics. If I had to choose a winner right now I'm not sure which one I'd choose. One of the things I like about infographics is you can squeeze a lot of content/infographic elements into a small space and it still looks good (as long as there is a rhythm or structure to the elements). So, to improve on the existing designs I would suggest making the existing elements smaller so you can put another element on the page...even if it's small. 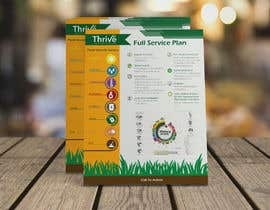 If you don't think re-organizing/re-arranging your page will look good then I'd try to find some way to enhance the flyer. But all the designs look good. I didn't expect them to look as good as they do (partly because I didn't think I did a good job with the project file) and there aren't any that are bad designs like is usually the case when we do contests. So the mowers will have to be removed. The ones I rated a 3 are actually a 3.5. The designs are better than I expected. We're going to write down some notes to send you guys. 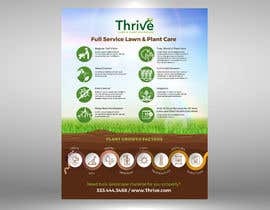 But one quick note now...Thrive is a Lawn Care company which means we don't cut grass...just chemical applications. 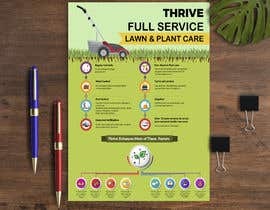 Lawn Care companies provide services to make lawns and plants healthier and greener and Landscaping companies (or Lawn Maintenance companies) are the companies who cut the grass. Most people don't know the difference. Anyway, I'm just telling you guys that because there are some lawn mowers in some of the designs. Working on an entry! I hope you're open to reviewing all files submitted before the contest deadline? Please, wait for my entry. OK, those are the type of entry's we're looking for for Part 1 of this design. I'll be getting into work in about an hour so let me show my team and I'll get back to the two designers who submitted a design with any suggestions. But they look professional which is what we want. Hi, I'm interested to participate. But the link to the me.docx seems not working and couldn't the file in the reference folder. Could you please re-attach the file maybe? Thanks.